Hortus Camdenensis | Narcissus tazetta subsp. tazetta L.
Narcissus tazetta subsp. tazetta L.
Bulbous perennial with sulphur-yellow, spreading perianth segments and cup-shaped, orange-yellow corona, one-third of the length of the segments. [Hortus, Baker Am.]. 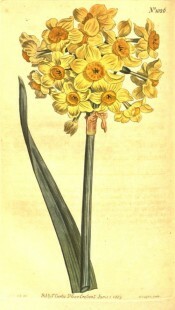 First described as Narcissus orientalis by Linnaeus in 1767 [Syst. Nat. ed.12, vol.22 p.235/1767]. Herbert described it as a cross between Hermione, a form of Narcissus tazetta, and Narcissus incomparabilis [BR vol.29 f.38/1843]. 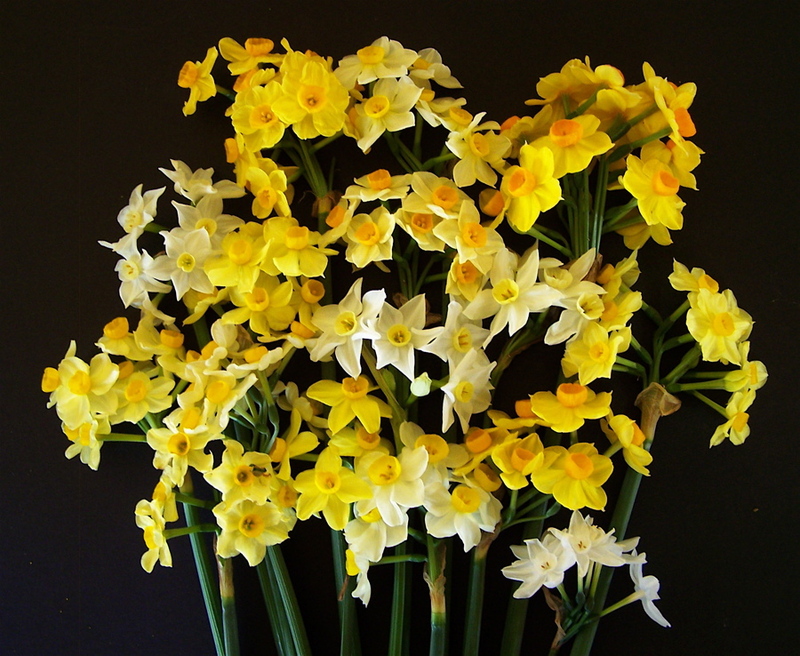 Baker considered it to be a form of Narcissus tazetta nd proposed the name Narcissus tazetta subsp. lacticolor. This view is now generally held and the name Narcissus tazetta subsp. tazetta applied. A large number of synonyms of Narcissus tazetta subsp. tazetta are given in The Plant List, 86 for Hermione and 47 for Narcissus, but only those directly pertinent to Linnaeus’ Narcissus orientalis are given here. For full synonymy see Narcissus tazetta subsp. tazetta in The Plant List. Curtis’s Botanical Magazine figures as varieties of Narcissus orientalis the ‘Yellow garden Narcissus’, regularly imported from Italy [BM t.1026/1807]; the ‘Many-flowered Narcissus of the Levant’, ‘included by Linnaeus in his Tazetta’ [BM t.946/1806]; and N. orientalis flore pleno, the ‘Cyprus or double roman Narcissus’. [BM t.1011/1807]. Other narcissi have been given the name orientalis, for example Johnson's Dictionary gives the origin of Narcissus orientalis as the Levant, describing it as white, clearly a different plant to that described here. The plant figured in Curtis’s Botanical Magazine as ‘Narcissus of the Levant’ [BM t.940/1806] is Narcissus trewianus Ker-Gawl., or ‘Baselman major’ which see, and may be synonymous with Johnson's plant. The ‘Cream-coloured Narcissus of the Levant’ [BM t.948/1806] is Narcissus x incomparabilis Mill. which see. The ‘Pale-cupped white garden Narcissus’ is described as ‘the real Orientalis of the Hortus Kewensis. The orientalis of Linnaeus is Narcissus biflorus of No. 197.’ [BM t.1298/1810]. [See Narcissus x medio-luteus Mill.]. In this Curtis’s Botanical Magazine is in agreement with Johnson’s Dictionary and is probably the source of the latter’s information. The ‘Pale-cupped white garden Narcissus’ appears to be synonymous with Hermione leucoifolia of Salisbury, in which case it is likely to be Narcissus tereticaulis Haw., a plant of Spanish origin. [THS vol.1 p.359/1805-1812]. Narcissus tereticaulis is considered by some to be a form of Narcissus tazetta L. and by others to be Narcissus x. intermedius Lois. of which there are a number of recognised forms. It is described and illustrated in Sweet’s British Flower Garden, vol.5, no.179/1838 as Hermione tereticaulis. The illustration is very similar to that given here except that the umbel has fewer flowers and the perianth segments are paler in colour. Listed in all published catalogues [B.345/1843]. Large numbers of tazettiform narcissi grow in the gardens today, including forms at least superfiacially similar to all of the plants described here. Click here for an illustration. Narcissus tazetta L. var. orientalis (L.) hort.